I noted last week that the Cybils award went to BookSpeak! by Laura Purdie Salas. This seems like a good moment to round up a few other recent poetry award announcements. The 20th recipient of the Lee Bennett Hopkins Poetry Award is Water Sings Blue by Kate Coombs. 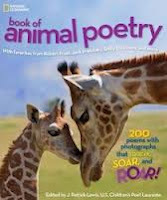 The Claudia Lewis Poetry Award this year went to The National Geographic Book of Animal Poetry edited by J. Patrick Lewis. Check out the digital trailer for this book and educator's guide linked to Common Core standards here. The most recent (2012) Lion and Unicorn Award for Excellence in North American Poetry goes to Roots and Blues: A Celebration by Arnold Adoff. Congratulations, winners! Thanks for setting the bar high for all of us. And thank you, award committees, for these marvelous, diverse selections. So glad to see science poetry, anthologies, and African American heritage get this special recognition. Over the last few years. my wonderful library school students and I have worked to create toolboxes of guides and digital trailers for each of the poetry award and honor books to help teachers, librarians, and parents share these wonderful books with young people. Be sure to check them out! 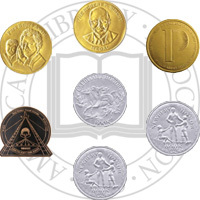 The Lee B. Hopkins Poetry Award Teaching Toolbox. Click here. The Claudia Lewis Poetry Award Teaching Toolbox. Click here. The Lion and Unicorn Poetry Award Teaching Toolbox. Click here. We'll be working on creating resources for the newest winners very soon! The CYBILS are the Children’s and Young Adult Bloggers’ Literary awards and I was lucky enough to serve on the second round of judges that selected the winner. Here’s our “official” review of BookSpeak! BookSpeak! celebrates all things books. One of our judges stated that it shows kids "how to look at a common object with new eyes." Another said, "I love the many 'voices' she created within the book world." 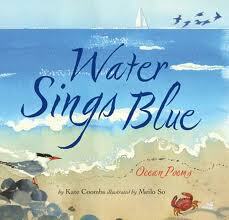 A third judge noted, "when read aloud, I feel these poems have heaps of personality--and utility, too." Laura Purdie Salas, explores reading, writing, stories, and book components in a wide variety of poetic forms, styles, and imaginative voices. From the lyrical "Skywriting" to the clever personification of “Index,” the poems flow from beginning to end, providing helpful models that young writers may enjoy exploring and imitating. Josee' Bisaillon's use of collage, digital montage, and drawings completes the whole package. Complemented by a distinctive use of typeface and energetic and expressive illustrations, BookSpeak! is a book of book poems that readers of all ages will return to again and again. I also loved Laura’s previous poetry collection, Stampede! Poems to Celebrate the Wild Side of School! (Clarion. 2009) and reviewed it here. In the spirit of full disclosure, I should also like to add that Laura has contributed poems to The Poetry Friday Anthology (both for K-5 and for the new book for 6-8) and we have so enjoyed working with her. Good thing we grabbed her BEFORE she got hugely famous! Finally, be sure to check out Laura’s blog, Writing the World for Kids, full of helpful teaching and writing tips and her website, of course. Thanks to our noble chair, Jone MacCulloch and my fellow committee members, Diane Mayr, Renee LaTulippe, Ed DeCaria, and Linda Baie. What fun we had talking/writing about poetry in depth! Adoff, Arnold. 1997. Love Letters. New York: Scholastic. cummings, e e. 2005. Love: Selected Poems by e e cummings. Ill. by Christopher Myers. Greenfield, Eloise. 2003. Honey, I Love. New York: HarperCollins. Hopkins, Lee Bennett. 2005. 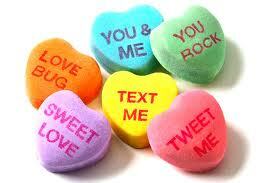 Valentine Hearts: Holiday Poetry. New York: HarperCollins. Lear, Edward. 2007. The Owl and the Pussycat. Toronto: Kids Can Press. Levine, Gail Carson. 2012. Forgive Me, I Meant to Do It: False Apology Poems. Ill. by Matthew Cordell. HarperCollins. Marzollo, Jean. 2000. I Love You: A Rebus Poem. New York: Scholastic. Mora, Pat. 2001. Ed. Love to Mamá: A Tribute to Mothers. New York: Lee & Low. Pearson, Susan. 2006. Slugs in Love. New York: Marshall Cavendish. Prelutsky, Jack. 1996. It’s Valentine’s Day. New York: HarperTrophy. Strachan, Linda. 2003. What Colour is Love? London: Bloomsbury. Walker, Rob D. 2009. Mama Says: A Book of Love For Mothers and Sons. Ill. by Leo and Diane Dillon. New York: Scholastic. Wilson, Karma. 2003. Bear Hugs: Romantically Ridiculous Animal Rhymes. New York: McElderry Books. Yolen, Jane. 2009. How Do Dinosaurs Say I Love You? New York: Scholastic. Block, Francesca Lia. 2008. How to (Un)Cage a Girl. New York: Joanna Cotler. Fletcher, Ralph J. 1998. Room Enough for Love: the Complete Poems of I Am Wings and Buried Alive: Poems. New York: Aladdin. Franco, Betsy. 2008. Falling Hard: Teenagers on Love. Somerville, MA: Candlewick Press. Hemphill, Stephanie. 2012. Sisters of Glass. New York: Knopf. Herrera, Juan Felipe. 1999. Crashboomlove. Albuquerque: University of New Mexico Press. Herrick, Steven. 2004. A Place Like This. New York: Simon Pulse. Herrick, Steven. 2004. Love, Ghosts, & Facial Hair. New York: Simon Pulse. Janeczko, Paul B. Ed. 2004. Blushing: Expressions of Love in Poems and Letters. New York: Scholastic. Merriam, Eve. 1983. If Only I Could Tell You: Poetry for Young Lovers and Dreamers. New York: Knopf. Mora, Pat. 2010. Dizzy in Your Eyes. New York: Knopf. Myers, Walter Dean. 2009. Amiri and Odette: A Dance for Two. New York: Scholastic. Pockell, Leslie. Ed. 2003. The 100 Best Love Poems of All Time. New York: Warner. Sayer, Viv. Ed. 2008. Poems of Love and Longing. London: Pont Books. Soto, Gary. 1990. A Fire in My Hands. New York: Scholastic. Soto, Gary. 2009. Partly Cloudy: Poems of Love and Longing. Orlando: Harcourt. Tregay, Sarah. 2012. Love & Leftovers. New York: Katherine Tegen. I was able to glean a few more nuggets about forthcoming poetry in 2013 while attending the ALA Midwinter conference in Seattle last week. It seemed to me that the numbers were down a bit and there wasn't as much poetry set to be published this spring as usual, but maybe I missed a bunch. Anyhoo, here is my stab at my annual “sneak peek” list of the poetry titles that are scheduled to be published in 2013, thus far. Of course this is subject to change with additional titles likely as the year rolls along. Bingham, Kelly. 2013. Formerly Shark Girl. Somerville, MA: Candlewick. Brown, Calef. 2013. We Go Together! : A Curious Selection of Affectionate Verse. Boston: Houghton Mifflin. Burg, Ann. 2013. Serafina’s Promise. New York: Scholastic. Cheng, Andrea. 2013. Etched in Clay: The Life of Dave, Enslaved Potter and Poet. New York: Lee & Low. Clark, Kristin Elizabeth. 2013. Freak Boy. New York: Macmillan. Crossan, Sarah. 2013. The Weight of Water. New York: Bloomsbury. Engle, Margarita. 2013. Mountain Dog. New York: Holt. Flood, Nancy Bo. 2013. Cowboy Up! Ride the Navajo Rodeo. Ill. byJan Sonnenmair. Honesdale, PA: Wordsong/Boyds Mills Press. Flores-Scott, Patrick. 2013. Jumped In. New York: Henry Holt. Froehlich, Susan and Rodman, Jonathan. 2013. Rabbit Turds. Edina, MN: Beaver’s Pond Press. Frost, Helen. 2013. Salt. New York: Farrar, Straus & Giroux. Held, George. 2013. Neighbors: The Yard Critters Too. Ill. by Joung Un Kim. New York: Filsinger & Co., Ltd.
Homer. 2014. The Odyssey. Translated by Stephen Mitchell. New York: Atria Books. Hopkins, Ellen. 2013. Smoke. New York: Simon & Schuster. Hopkins, Lee Bennett. 2013. All the World’s a Stage. Ill. by Guy Billout. Minneapolis, MN: Creative Editions. Hughes, Langston. 2013. Lullaby (for a Black Mother). Ill. by Sean Qualls. Boston: Houghton Mifflin Harcourt. Keenan, Sheila. 2013. As the Crow Flies. Ill. by Kevin Duggan. New York: Feiwel & Friends. Kennedy, Caroline. Ed. 2013. Poems to Learn by Heart. Ill. by John Muth. New York: Hyperion. Koertge, Ron. 2013. Coaltown Jesus. Somerville, MA: Candlewick. Koertge, Ron. 2013. The Ogre’s Wife: Poems. Pasadena, CA: Red Hen Press. Lawson, JonArno. 2013. Enjoy It While It Hurts. Wolsak & Wynn. Lesynski, Loris. 2013. Crazy About Basketball! Toronto, CA: Annick Press. Lewis, J. Patrick. 2013. The Good Ship Crocodile. Ill. by Monique Felix. Creative Editions. Maccarone, Grace. 2013. Princess Tales: Once Upon a Time in Rhyme with Seek and Find Pictures. New York: Feiwel & Friends. MacDonald, Maryann. 2013. Odette’s Secrets. New York: Bloomsbury. McGrath, Barbara Barbieri. 2013. Teddy Bear Patterns. Watertown, MA: Charlesbridge. McPhail, David. Comp. 2013. My Mother Goose: A Collection of Favorite Rhymes, Songs, and Concepts. New York: Roaring Brook. Morpurgo, Michael and Clare. 2013. (Reprint) My Wellies Take Me. Ill. by Olivia Lomenech Gill. Templar. Pendziwol, Jean K. 201. Once Upon a Northern Night. Ill. by Isabelle Arsenault. Toronto, Canada: Groundwood. Powell, Patricia Hruby. 2013. Josephine. Ill. by Christian Robinson. San Francisco: Chronicle. Prelutsky, Jack. 2013. The Silver Moon: Lullabies and Cradle Songs. Ill. by Jui Ishida. New York: Greenwillow/HarperCollins. Rampersad, Arnold and Blount, Marcellus (Eds). 2013. 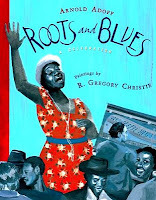 Poetry for Young People: African American Poetry. Ill. by Karen Barbour. New York: Sterling. Sax, Aline. 2013. The War Within These Walls. Ill. by Caryl Strzelecki. Grand Rapids, MI: Eerdmans. Smith, Charles R., Jr. 2013. Brick by Brick. New York: Amistad/ HarperCollins. Sones, Sonya. 2013. To Be Perfectly Honest: A Novel Based on an Untrue Story. New York: Simon & Schuster. Sternberg, Julie. 2013. Like Bug Juice on a Burger. Ill. by Matthew Cordell. New York: Abrams. Thompson, Holly. 2013. The Language Inside. New York: Delacorte. Vardell, Sylvia and Wong, Janet. 2013. The Poetry Friday Anthology for Middle School (Grades 6-8). Princeton, NJ: Pomelo Books. Vestergaard, Hope. Digger Dozer Dumper. Ill. by David Slonim. Somerville, MA: Candlewick. Weston, Robert Paul. 2013. Prince Puggly of Spud and the Kingdom of Spiff. New York: Razorbill/Penguin. Wissinger, Tamera Will. 2013. Gone Fishing: A Novel in Verse. Ill. by Matthew Cordell. New York: Houghton Mifflin Harcourt. Worth, Valerie. 2013. Pug. Ill. by Steve Jenkins. New York: Farrar, Straus & Giroux. Meanwhile, join us at A Teaching Life where Tara is hosting the always fabulous Poetry Friday line up. I’m still working away on gathering my notes and scribbles about the forthcoming poetry for 2013 (which I’ll post soon), but meanwhile I wanted to give a shout-out to the poetry books that got a nod at this week’s announcements of awards at ALA Midwinter. The biggest thrill and surprise was the Newbery winner, The One and Only Ivan by Katherine Applegate, which I felt was a work of poetry—although many disagree with me. Either way, it’s a tender story beautifully rendered. Spare and thoughtful. With prose written by a gorilla of a writer. You may remember Katherine Applegate’s novel in verse, Home of the Brave—also powerful writing from an authentic (YA) point of view. Bryan Collier won the Coretta Scott King illustrator award for his art for the classic Langston Hughes poem, “I, Too, Am America.” His graphic collages give the beautiful a fresh and slightly edgy interpretation in the picture book adaptation. And congratulations to Lesléa Newman for garnering a Stonewall award honor for her heart-breaking novel in verse, October Mourning. That story (about Matthew Shepard’s murder) is so hard, and the poetry from multiple points of view is achingly beautiful—so well crafted. Happy February everyone. 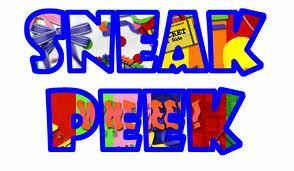 Watch for the sneak peek list of 2013 poetry coming soon. And join the Poetry Friday party at Teaching Authors. See you there!